I have to get something off my chest. I love my Persian momma, and I love her Persian cooking, but I’ll be frank. 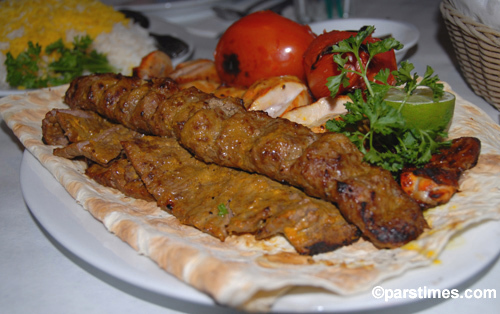 Persian food tastes fantastic, but it’s not the most esthetically attractive cuisine in the world. 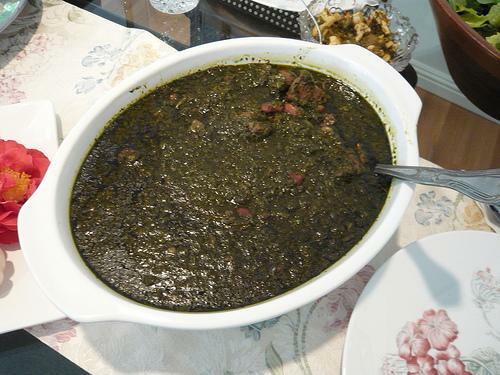 Take one look at some of Iran’s signature dishes and you’ll see what I mean. Ghormeh sabzi, a light and tangy beef and herb stew, looks like this, and check out our prized tender and flavourful kabob. But by far the most un-Martha looking dish happens to also be the most delicious (I’ll spare you the image… Google it if you really want to see). It is the gem of Persian cuisine, koresh fesenjan: duck stew with pomegranate and walnuts. I love fesenjan, but I had to find a way to make it a little prettier. So I decided to forego the traditional route of simmering the bird forever in the walnut sauce (which results in a big, brown, tasty mess). Instead, the duck is braised in the pomegranate juice alone, then removed while it’s nice and red and shiny. The sauce is then finished with the walnuts to create that famously rich and complex gravy. Traditionally, pomegranate molasses is used to make fesenjan, but since that may be hard to find kosher, I use bottled pomegranate juice (i.e., Pom Wonderful) instead. Just be careful to get the pomegranate-only version (with the dark red cap), as there are Poms that include a blend of other fruit juices. This duck deserves to be served with something bright yellow and slightly sweet – mashed butternut squash or a saffron polenta. Or, if you’re more of a purist, serve it alongside a huge, steaming mound of saffron basmati rice. Heat a large electric wok or dutch oven (add a little oil if substituting chicken; duck doesn’t need the added oil as it own fat will render in the hot pan). Sprinkle the duck pieces with salt. Working in batches, brown the duck on all sides over medium-high heat and remove to a platter. You will end up with a good amount of duck fat in the pan – use a spoon to remove about a third of the fat. Reduce the heat to medium and add the onions, stirring constantly, until they begin to brown. Stir in the pepper, cloves and garlic, then deglaze the wok with about 2 cups of the pomegranate juice, using a wooden spoon to loosen the browned bits from the bottom of the pan. Arrange the duck pieces back in the pan, layering the legs on the bottom and the breasts on top (with the wings, if using). Add the rest of the pomegranate juice (it should almost cover the duck). Simmer, covered, about 30 minutes. Remove the duck pieces and set them aside. Add the walnuts to the pomegranate juice and simmer, uncovered, for 30 minutes. The walnuts will soften and the sauce will reduce. Use an immersion blender to puree the walnuts in the juice, until it is as smooth as you like it. Stir in the honey and season with salt to taste. You will end up with a lot of extra sauce, but c’est la vie. To serve, reheat the duck in the oven, covered. Spoon the hot walnut sauce into the middle of the plate (or on the bottom of a large serving platter) and arrange the duck on top. Garnish the duck with chopped parsley, and pass the remaining walnut sauce around in a gravy boat. This aromatic brisket may be the most tender you will ever have. Forget about leathery, tough slivers of beef – this is so soft you may not even be able to slice it properly, but at any rate, it will fall apart in your mouth, guaranteed. It is known also as the Wednesday Brisket because, if you’re making this for Shabbos, you start it on Wednesday night. But don’t let that put you off – it is so simple to prepare that it doesn’t feel like cooking at all. And really, it’s not! You just throw everything into your chollent pot (slow-cooker) before bed and let it simmer through the night. When you wake up the next morning, with the most mouth-watering smell permeating your home, you simply plop the brisket into a baking dish, sauce and all, and leave it in the fridge for the rest of the day. That rest time gives the meat a chance to really soak up the flavours and become even more tender. Then, on Friday morning, it’s just a matter of slicing the brisket and simmering the sauce a little bit on the stovetop. And that’s really it! Place the brisket in a chollent pot and cover it with all of the other ingredients (except for the parsley). Put the lid on and set it to low heat (it should cook for about 8 hours). Then go to sleep and dream about beef! Transfer the brisket to a baking dish. If there are large deposits of fat on the meat, trim them off now while the brisket is hot. Pour all of the juices into the baking dish too, then cover with plastic wrap and put the brisket in the fridge. Then get on with your day and daydream about beef! Use a spoon to remove the solidified fat from the surface of the sauce. Transfer the juices to a saucepan or a pot, and simmer, about 20 minutes or until the sauce has thickened a little. Carefully transfer the brisket slices back into the baking dish, then pour the sauce back over the meat. Cover and warm through in the oven just before serving. Garnish the brisket with chopped fresh parsley or cilantro.